During this years Masters telecast, CBS Sports played shuffle with the leaderboard to make sure Tiger Woods and Phil Mickelson appeared on "page one" to help hype the coverage of the next round. Golf purists probably did not like it as it went against the traditional way of posting scores. But that was to get him on "page one." 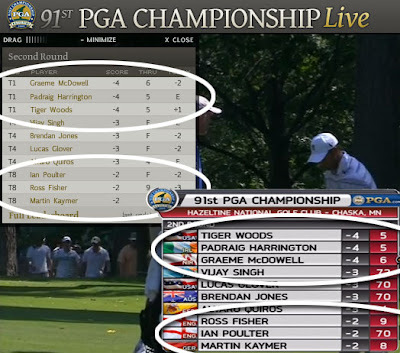 But what happens if Tiger is already firmly planted on the first page of the leaderboard? Well T(iger)NT Sports (aka TNT Sports) answered that question with their online "marquee group" coverage this past week. Tiger was tied for the lead at the time, but technically should not have been listed first because he was playing behind Graeme McDowell. Yes, Tiger Woods is driving golf ratings and money. But golf is a game of etiquette and rules. Can't the networks please apply it to their reporting of scores and information as well?